Our honeymoon will be enhanced with a stay in the King Hilton Guestroom. This spacious, enchanting retreat boasts large windows, a mini bar, LED TV, fine furnishings, a work desk with an ergonomic chair, a king size bed with luscious linens, and an elegant bathroom with a shower and lavish amenities. 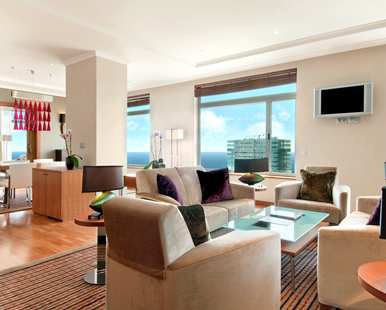 In the comfort of our room, we will admire stunning city or sea views from the windows. We will enjoy a delightful stay in the Hilton Relaxation Room on our romantic honeymoon. This spacious, soothing sanctuary boasts fresh flowers, a mini bar, LED TV, fine furnishings including a large armchair with an ottoman and a work desk with an ergonomic chair, a king size bed with luscious linens, cozy bathrobes, and an elegant bathroom with a shower, a hydro-spa and lavish amenities. 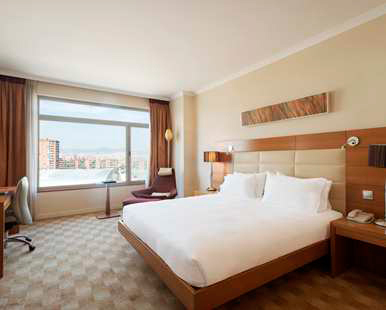 In the comfort of our room, we will admire stunning city or sea views from the windows. With your wonderful wedding gift, we will enjoy the settings of the King Bed City View Room. This spacious, contemporary retreat boasts a mini bar, a LED TV, fine furnishings, a work desk with an ergonomic chair, a king size bed with luscious linens, cozy bathrobes and slippers, and an elegant bathroom with a separate bathtub and shower and lavish amenities. From the comfort of our room, we will admire breathtaking views of the city. Together we will enjoy the charming settings of the King Bed Deluxe Room. This spacious sanctuary boasts a mini bar, LED TV, fine furnishings, a work desk with an ergonomic chair, a king size bed with luscious linens, and an elegant bathroom with lavish amenities. From the comfort of our room, we will admire breathtaking views of the city. A stay in the King Bed Partial Sea View Room promises us an unforgettable honeymoon experience! This honeymoon haven boasts a mini bar, LED TV, fine furnishings, a work desk with an ergonomic chair, a king size bed with luscious linens, cozy bathrobes and slippers, and an elegant bathroom with a separate bathtub and shower and lavish amenities. 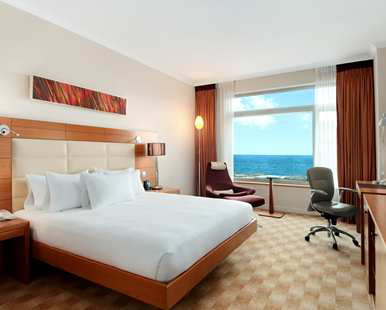 In our spacious, contemporary room, we will witness partial sea views. 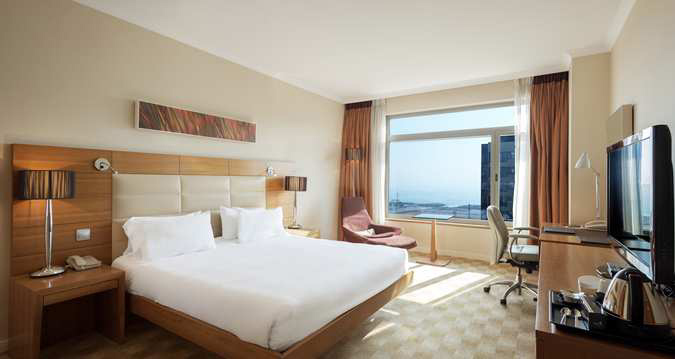 On our honeymoon at Hilton Diagonal Mar Barcelona, we will take delight in a stay in the King Hilton Sea View Room. Situated on the highest floors, our romantic retreat boasts a mini bar, LED TV, fine furnishings, a work desk with an ergonomic chair, a king size bed with luscious linens, and an elegant bathroom with a separate bathtub and shower and lavish amenities. In this spacious, contemporary room, we will enjoy spectacular Mediterranean Sea views from the edge of this inspiring city. 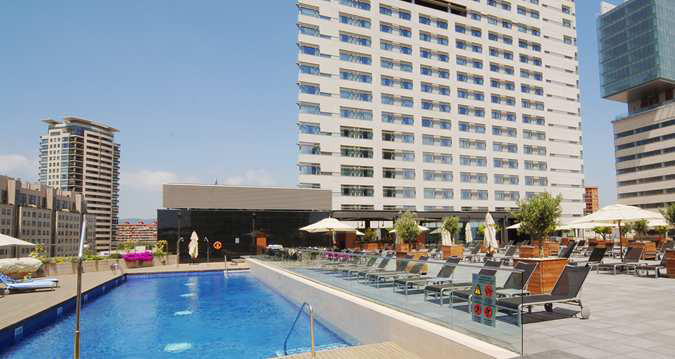 At Hilton Diagonal Mar Barcelona we will luxuriate in the exclusive settings of the Club Executive Suite. Our spacious, stunning sanctuary boasts executive lounge access including complimentary breakfast and refreshments, a mini bar, a separate living and dining area with fine furnishings and LED TV, a work desk with an ergonomic chair, a king size bed with luscious linens, cozy bathrobes, and an elegant bathroom with a separate bathtub and shower and lavish amenities. From the comfort of our suite, we will enjoy striking city or Mediterranean Sea views. 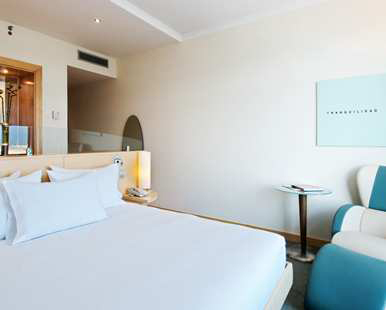 The Junior Suite promises us an exclusive stay at Hilton Diagonal Mar Barcelona. This bright and airy romantic retreat boasts executive lounge access including complimentary breakfast and refreshments, a mini bar, a separate living and dining area with fine furnishings and LED TV, a work desk with an ergonomic chair, a king size bed with luscious linens, cozy bathrobes, and an elegant bathroom with a separate shower and whirlpool and lavish amenities. From the comfort of our suite, we will admire breathtaking city or Mediterranean Sea views. 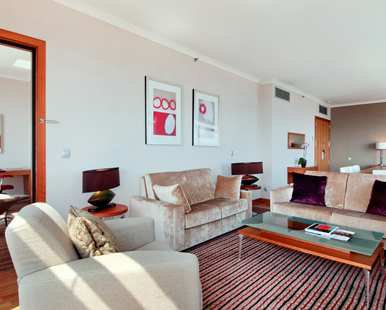 Hilton Diagonal Mar Barcelona promises us an exclusive stay in the Presidential Suite on our romantic honeymoon. This stunning, spacious suite boasts executive lounge access including complimentary breakfast and refreshments, a mini bar, a separate living and dining area with fine furnishings and LED TV, a kitchenette, a work desk with an ergonomic chair, a king size bed with luscious linens, cozy bathrobes, and an elegant marble bathroom with a separate walk-in shower and whirlpool and lavish amenities, and a second bathroom. Located on the top floor of the hotel, we will admire breathtaking views from the comfort of our suite. A stay in the King Hilton Executive Room is a lovely wedding gift for our honeymoon in Barcelona, Spain. This bright and airy room boasts executive lounge access including complimentary breakfast and refreshments, a mini bar, fine furnishings, LED TV, a work desk with an ergonomic chair, a king size bed with luscious linens, cozy bathrobes, and an elegant bathroom with a shower and lavish amenities. From the comfort of our suite, we will enjoy pure honeymoon bliss! On our romantic honeymoon, we will enjoy a goat’s cheese pizza or seasonal fresh fruit salad in the comfort of our room with 24-hour room service. We will also choose from a mini beef burger or crunchy fish sticks and fries, cod cooked in sherry with Catalan-style spinach, and more. 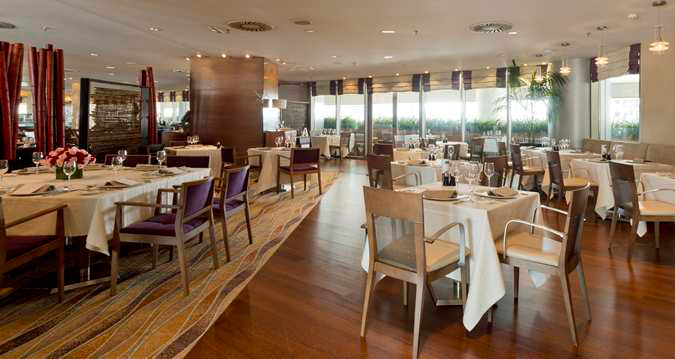 We will enjoy dining at this modern Barcelona restaurant on our romantic honeymoon! Indigo Restaurant & Terrace specializes in Mediterranean and Catalan cuisine and always uses the freshest, seasonal ingredients from local sources. Their Sommelier is always on hand to help us choose from the extensive wine list to accompany our meal at this stylish Barcelona restaurant. We will enjoy each other’s company over a specialty coffee in this informal Barcelona bar at the Hilton Diagonal Mar Barcelona on our honeymoon. We will unwind after a busy day exploring with a mojito cocktail or a rum from the bar’s wide range. We can mix and match some delicious Spanish tapas, too. We will start our day with their Continental Breakfast of coffee or tea, juice, a bakery item and a piece of bread. Open seasonally, Brisa Pool Bar & Terrace is the perfect place to make the most of the good weather and soak up the beautiful scenery of the Mediterranean Sea. We will relax in the sun as we cool down with a fresh fruit juice or ice cream and savor barbecued specialties, salads, tempting “tapas” or one of their famous Hilton Classics. This restaurant and bar features a chill-out space with music and a relaxing atmosphere, where we can choose exquisite cocktails from their menu, including refreshing frozen cocktails and the classic Mojito and Cosmopolitan. Every day of August, Brisa Pool Bar & Terrace offers exclusive “a la carte service” from the skilled Chef Pedro Corredor. We will enjoy their service until 1 am! 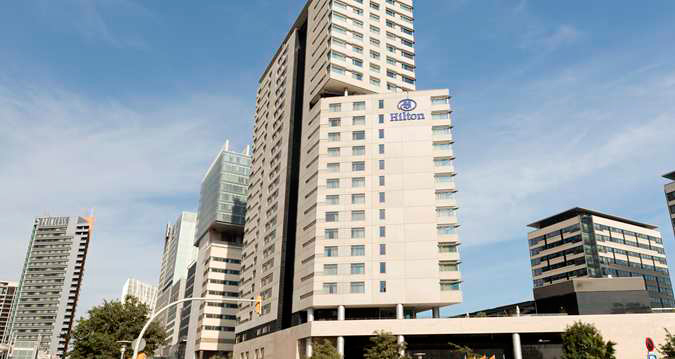 Located in beautiful Barcelona, Spain, only a 5-minute walk from the beach, Hilton Diagonal Mar Barcelona promises us an unforgettable honeymoon destination. At this charming, Spanish hotel, we will indulge in delicious International and Catalan food or unwind and enjoy a round of drinks and Mediterranean dishes. We will enjoy a bottle of wine or champagne from the comfort of our room with room service. With your wonderful wedding gift, we will create delightful honeymoon memories with this extra resort credit! 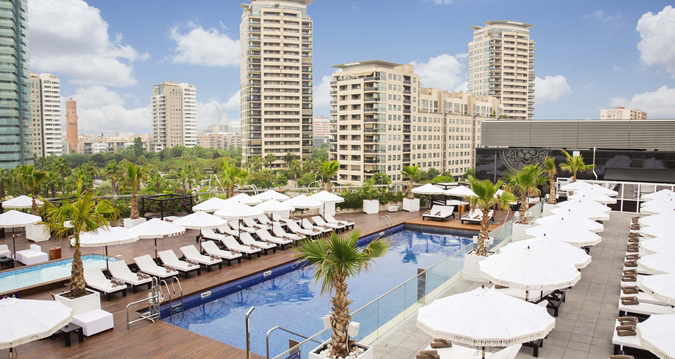 Hilton Diagonal Mar Barcelona is located in the heart of Barcelona’s financial district and is just a 5-miunte walk from a beautiful Spanish beach. This enchanting hotel offers us bright and spacious guest rooms, deluxe rooms, executive room and suites, and unique relaxation rooms featuring distinct rest, refresh, relax, and work zones including bathrooms with a hydro-spa. 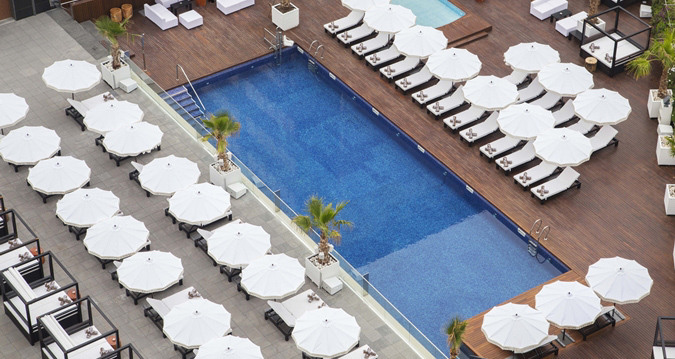 We will relax by the seasonal outdoor pool and enjoy cocktails and a poolside lunch at the stylish Barcelona Brisa Pool Bar & Terrace. In the contemporary settings of The Indigo Restaurant, we will indulge in a fusion of Mediterranean and Catalan cuisine, or at Pistaccio Lobby Bar & Lounge we will unwind with authentic tapas dishes and drinks. At the hotel’s fitness center we will stay fit or visit the beach for a refreshing swim. 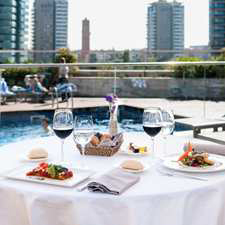 Hilton Diagonal Mar Barcelona will enhance our honeymoon with impressive amenities, timeless elegance and warm hospitality. A chilled bottle of champagne will be delivered to our room or suite. We will make a toast to our romantic honeymoon in Barcelona, Spain while taking in the panoramic views from the comfort of our room or suite. A bottle of our favorite wine will be delivered to our room or suite. We will make a toast to our honeymoon while taking in the charming Mediterranean Sea and city views of Barcelona, Spain. Basking in the warm Mediterranean sun all year round, Barcelona is a beautiful city bursting with energy. 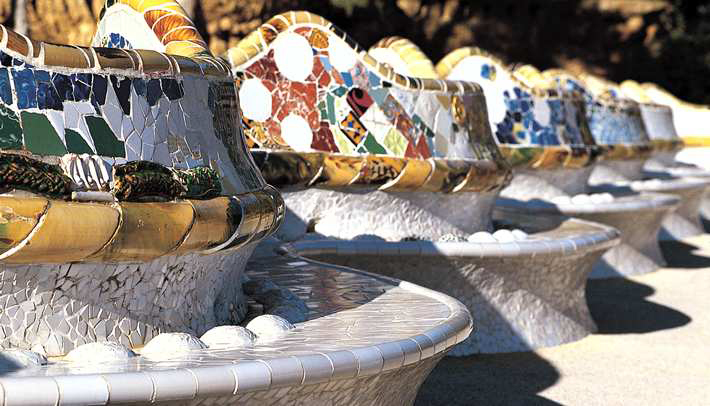 The fashionable Catalan capital is overflowing with style and is famed for its sophistication, cosmopolitan atmosphere. We will marvel at the spectacular architecture of Antoni Gaudi or stroll along the famous Les Ramblas promenade where street performers entertain. We will explore the city’s fascination museums, sample local delicacies in a pavement café or simply laze on the soft sandy beach. With this exclusive offer, we will enjoy a 2-night stay at Hilton Diagonal Mar Barcelona in a double room with breakfast for two included, receive a welcome VIP Afrodita Cocktail at the Pistaccio Lobby Bar the day of our arrival, and put the Barcelona City Card to good use, which offers free travel on public transport as well as discounts and free offers in selected museums, shops, restaurants, leisure, and entertainment. 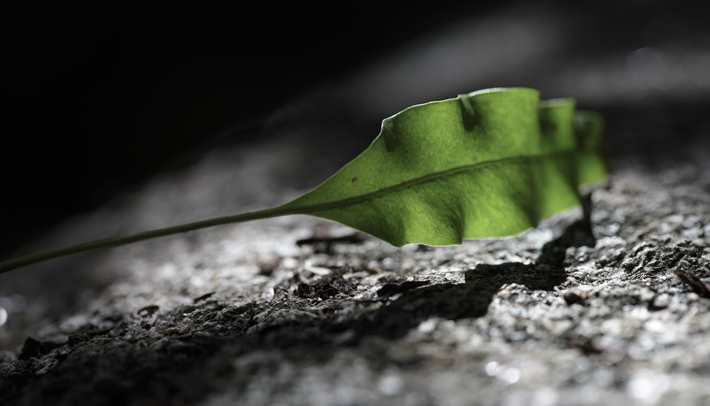 Together we will discover Barcelona in an eco-friendly way with their Green Key Package. We will take a tour of the Modernist City at our leisure and reduce our carbon footprint at the same time using an electric bicycle. Afterwards, we will reward ourselves with a complimentary ‘Sweet Ginger Cocktail’ with fresh strawberry, orange juice, strawberry syrup and ginger ale at Pistaccio Bar. Our package also includes a 1-night stay in a double room, breakfast for two, late check-out upon availability, and a special discount for ticket entrance at Museu Blau. We will celebrate the greatest day of our lives at Hilton Diagonal Mar Barcelona in Barcelona, Spain. With your generous wedding gift, we will experience the wedding ceremony of our dreams while our family and friends gather to witness our beloved day. Our on-site wedding coordinator will take care of every single detail for our big day from our ceremony to the reception and all guest arrangements. Whether we are planning an elegant event or an intimate wedding, Hilton Diagonal Mar Barcelona will ensure that our day is pure perfection!